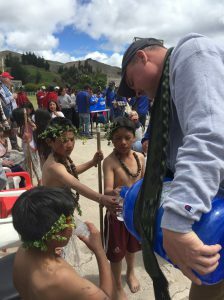 Brian & I joined their recent trip to a remote school in Guote, Ecuador named Atahualpa. This school has around 400 children 1st-12th grade. Some kids walk up to 15km (an hour and a half!) ONE way to school. Spanish is their second language- the indigenous language called Cetchzwa is the language they speak at home. The school includes a school of husbandry, teaching them how to raise rabbits, guinea pigs and also an extensive garden. Their curriculum includes how to raise different types of vegetables; available for the community with the goal to increase the variety of vegetables they grow/eat. There were two teams on this trip- an education team and an installation team. Brian helped with the installation. This group has to be innovative and flexible- as each community provides it’s own complex situation for it’s water source. When the installation is complete, Agua Viva GIVES the system to the community to do with as they need. I was on the education team. It is a comprehensive curriculum that weaves biblical truths with principals about the parasites/viruses present in water that can make you sick, how germs are spread, and the uses of this purified water they were getting. We taught 6 teachers from the school, who in turn takes the curriculum and teaches it to their students; with the hope the students will in turn take this information to their parents. The school decided they wanted to in turn take this curriculum and educate 14 more schools around them locally! Some of the things the students were shocked about? That there is a living world beyond what our eyes can see. That it’s not a good practice to have pigs & chickens running around in your your house where you eat and sleep; and how easy it is to spread germs. The last day is usually a day of celebration and blessing of the installation of the water filtration system. This was so lovely! The community comes and celebrates with us. The pastor of the community came to speak- it was humbling he asked God would bless us in return- which I felt we received by guarding our lives the very next day! Take time to watch the videos they are really fun to watch! Brian & I feel very blessed by the friendships we made and being around such hardworking faithful people that made this all happen.